Overland Park Regional Medical Center is one of the premiere medical facilities in Johnson County. The hospital is a licensed 350-bed facility offering acute and outpatient medical care services to the Overland Park community and the surrounding areas since December of 1978. 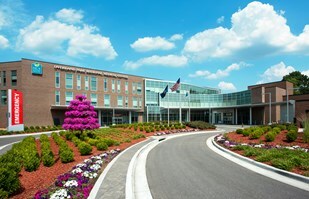 The hospital campus features four medical office buildings, two pharmacies and the offices of more than 100 physicians. Our services include Emergency Services, a Regional Trauma Center, an Accredited Chest Pain Center, The Women's Center with a Level III NICU, the Human Motion Institute, advanced diagnostic imaging, a Diabetes Center and many other specialty care services. With the support of 700+ physicians and 1300+ staff, we offer the latest in technological advances and we are committed to providing every patient with the highest level of care in an environment where people, compassion, community and integrity are valued. HCA Midwest Health is the area’s largest healthcare network, consisting of hospitals, outpatient centers, clinics, physician practices, surgery centers and an array of other services to meet the healthcare needs of the greater Kansas City area. More than bricks and mortar, what makes us truly unique is the thousands of compassionate, caring professionals that work tirelessly to not only provide our patients with the highest quality of care when sick, but who also remain committed to keeping patients well. Learn more in our annual report. At HCA Midwest, we are located in the heart of Kansas City with a community that is consistently listed as one of the top 10 places to live in the U.S. due to the affordability of housing, great job market, cultural interests, sports activities and facilities, school systems and geographic location. Kansas City is the perfect balance of nice and hospitable, as well as competitive and passionately driven. From all-star athletes and Pulitzer Prize winners to entrepreneurs and up-and-coming young professionals, KC is full of game-changers. The Huffington Post, National Geographic, CNBC and Thrillist all agree, Kansas City is a top place to live and work. Kansas City is a two-state region that encompasses 18 counties and is home to more than 2.3 million Kansas Citians. We encourage you to flip through the pages of KC Options magazine to learn more about the many communities, cultural and culinary assets, see a map of the metro area and much more.